Midyim berries (aka. midgen berry, sand berry) are among the most delicious of all the bush tucker plants, similar in taste and appearance to the blueberry; a favourite among the Aboriginal people. Out in the wild, you’ll find it in sandy soils across heath, scrub, open forest and rainforest margin terrains in NSW and QLD. This shrub bears small white, purple-speckled berries in profusion throughout late Summer and early Autumn. Berries are sweet and tangy, and may be eaten fresh or used in pies and preserves. Small white star-shaped flowers appear in early Summer. Keep the soil moist and well-fed to ensure a good harvest of berries in the following months. A light trim after harvesting will help keep the plant bushy and encourage new growth, rewarding you with a another crop the following season. This dense, bushy plant does best in full sun or part shade. New leaves are burgundy/bronze in colour, transitioning to rich green as they mature. 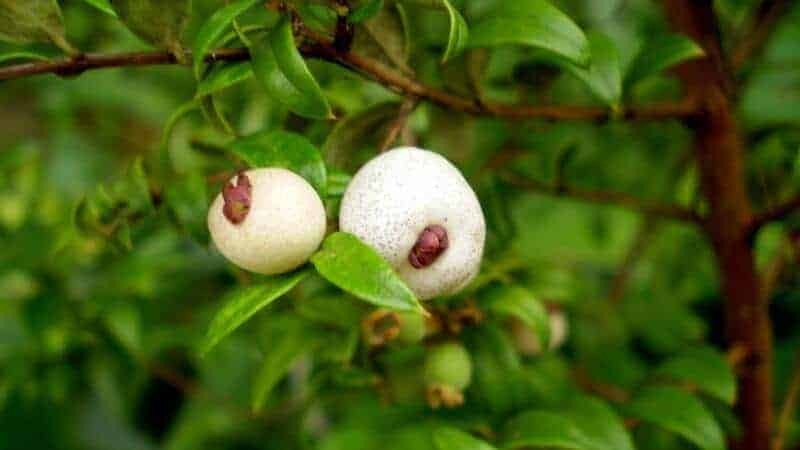 Midyim berry is relatively free from pests and diseases, making them ideal edibles for organic gardens. Though it can grow up to 2m in height, this versatile evergreen shrub can be easily kept small for home gardens. It’s perfect for filling in gaps or providing an edible box hedge, and with regular trimming will work well in narrow garden beds. Why are my midyim berry leaves turning pale? Your soil may be too limey. Midyim berry prefers a neutral to slightly acidic soil pH. My Midyim berry plant produces lots of leaves but no flowers or fruit. What do I do? Help! I water my midyim berry plant every day, but it’s still dying. What’s going on? Over-watering can do as much damage as under-watering, especially in a pot.. Only water your Midyim berry twice a week in hot weather. If your plant is in a pot, check your potting mix hasn’t gone off – otherwise, re-pot into fresh, quality potting mix.